In high heels Edna manages to look five feet tall. Her eyes are greenish-gray, her hair, a copperish color and she wears the smallest gloves manufactured. At nineteen, she left her Berkeley, California, home to play for the Duncan Sisters. Later she toured in vaudeville with Oklahoma Bob Albright. Her initial broadcast was over station 3-LO in Sydney, Australia. For several seasons she played at the Kit Kat Club in London. Home again, she married Milton Hayes, business man. 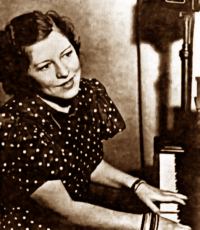 Edna Fischer was a pianist whose music was heard regularly on KPO. Her long radio career began on an early KRE broadcast. In 1926, she joined KFRC, where she was a regular on the “Blue Monday Jamboree” and “Happy Go Lucky Hour.” That was followed by two decades with KPO and NBC, where she regularly appeared on Signal Oil’s “Carefree Carnival” with Meredith Willson and Tommy Harris, fellow KFRC transplants. She also wrote that program’s theme song. Her own program, “Stars in the Making” on KPO, featured rising San Francisco music talent. Edna Fischer moved to television in the early 1950s, when she became Music Director of KPIX-TV (Channel 5). In 2006, she was elected to the Bay Area Radio Hall of Fame as a member of the first class to be inducted. 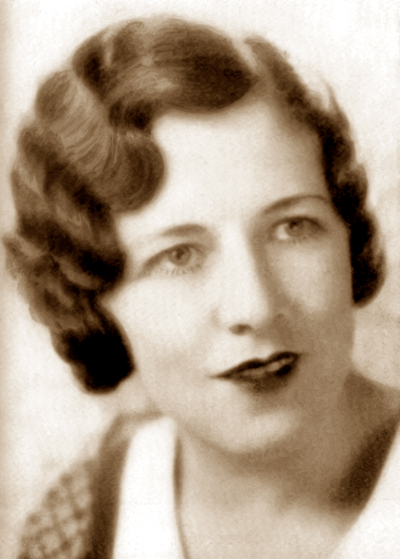 Photo (above) from Stars Of The Radio, 1932 Edition, Collection of the Bay Area Radio Museum. Photo (right) from a 1934 KPO promotional booklet. Courtesy of Rich Kolm, from the files of his father, Lee Kolm.